Designs made with colored powder decorate a South Austin porch in celebration of the Indian festival of Diwali on Saturday. Stenciled designs made with colored powder ran along the edges of a South Austin porch Saturday. 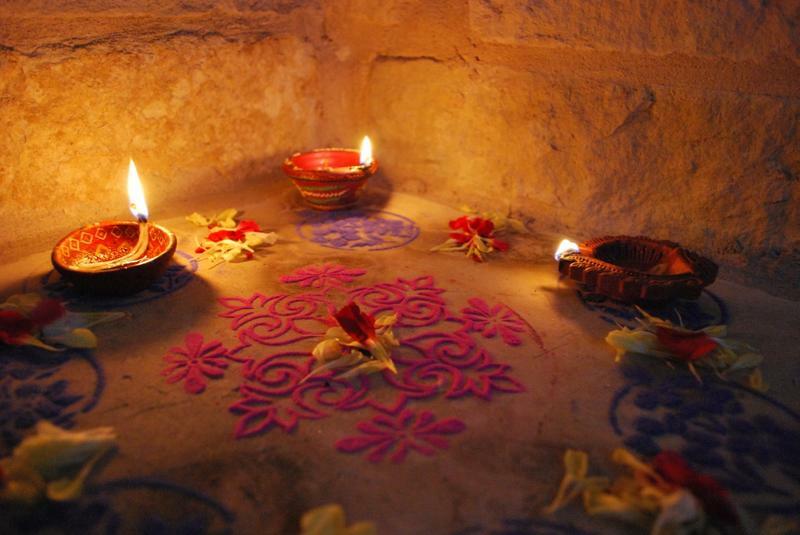 This traditional rangoli was displayed between little oil lamps called diyas as part of the Diwali tradition. Inside, a dozen young Indian families celebrated. It was the last day of Diwali, or Deepawali, the festival of lights. The holiday is considered a celebration of good conquering evil or light overcoming darkness. Because it is one of the most popular festivals in India, most of the guests who grew up in India recalled what Diwali was like for them. Common stories emerged of not just lighting diyas, but exchanging homemade treats with neighbors, visiting friends and family, dressing up and eating tasty food. 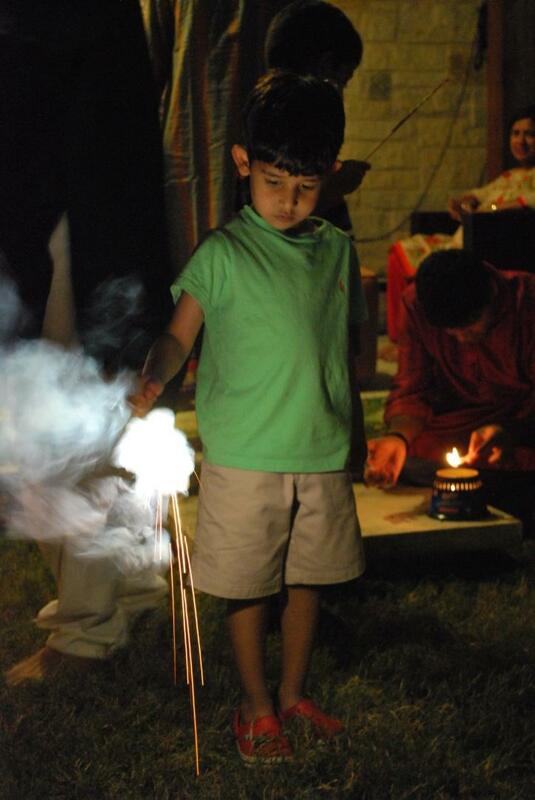 Ved Karia plays with a sparkler at the Diwali party. Now parents themselves, they were looking for ways to share the intensity of the experience in India with their children growing up in the United States. “During Diwali, you [would] see a paper lantern outside of every house,” Dhanashri Karia said. “In every balcony, at the entrance of every house – and they’re just so beautiful. Me and my Dad, we made one every year – from scratch. Now, Karia makes the lanterns with her older son. Chaitanya Naravane said he also misses seeing the paper lanterns in every balcony of high-rises in India. In the United States, where homes are more spread out, it’s harder to notice that it’s Diwali at all, Naravane said. A big part of Diwali celebrations in India is setting off fireworks. Kale said she also misses keeping real diyas with open flames outside. 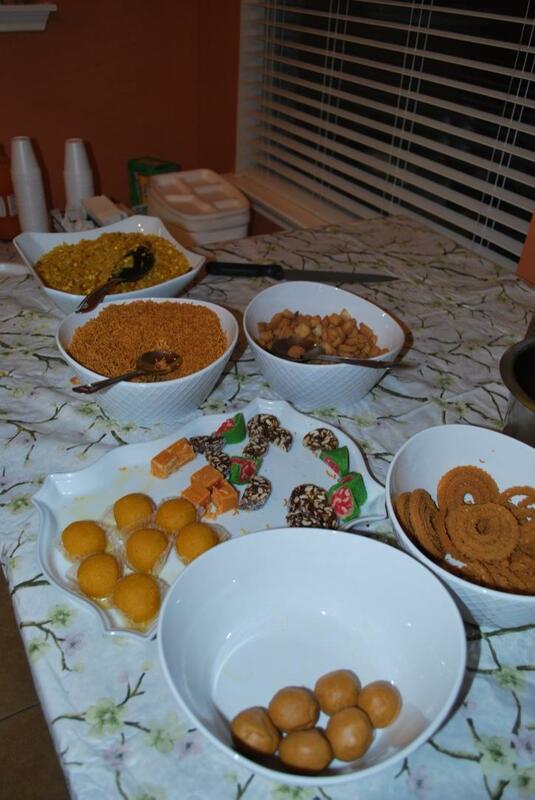 The Diwali spread includes traditional Indian sweets. Kale included muffins in the assortment of traditional sweets and applied mehndi (henna) to her daughter Aanya’s hands. Kirti Bhave also made some alterations to Diwali traditions. One of the days of Diwali is called Bhav Bij, which celebrates the relationship between brother and sister. Since Bhave has two daughters, she is making the day about celebrating the relationship between two sisters. Vibhas and Aparna Deshpande host this party every year with their close friends. The hosts created a traditional atmosphere with sweets, an Indian dinner and fireworks. The evening included a Harry Potter scavenger hunt, sack races and an archery competition. The kids came over earlier in the afternoon to build a killa, or fort, which is a typical Maharashtrian way of celebrating Diwali. They decorated their mud fort structures with improvised flags and action figures. Since the holiday falls in the middle of the school year, it's impossible to travel to India without missing school. One guest, Mayuresh Gogate, grew up in Botswana. Since there wasn't a large Indian community to celebrate with, Diwali was fairly low key for him. Now that he’s part of a bigger Indian community in Austin, he says he's able to do a lot more. Sangita Menon is an intern at KUT.